Politics of Forgetfulness: President Sata’s Disremembrance of Frederick Chiluba | Elias Munshya, LL.M, MBA, M.DIV. During the Memorial Day weekend, President Michael Chilufya Sata while laying wreaths on the World War I Memorial Cenotaph castigated both his Vice-President and Minister of Works over Chiluba’s tombstone. For some reason, Sata found it unacceptable that a place where the remains of Chiluba are buried could be in such a deplorable condition. In many ways, Sata is right. The PF government should take care of the memory of President Frederick Jacob Titus Chiluba. However, at close inspection, we discover that Sata’s sudden interest in the sanitation of Chiluba’s tombstone comes with some questions that he himself must answer. Michael Sata’s ministers have neglected Chiluba’s resting place partly because Sata, himself, has chosen deliberately to disremember Chiluba. And the ministers have gotten a clue from Sata’s behaviour. As such, instead of blaming Mukanga and Scott over the legacy of Frederick Chiluba, Michael Sata should own this absurdity and for once decide to do the right thing. And here is the right thing: instead of incessantly berating his subordinates, Sata should lead the way. He should honor not only the tombstone but also the conscious memory of that short man who walked tall. We are a people of memory. In fact, we become a nation by the memories we choose to share and cherish. The memory of those who lived among us and showed us the way, become an inspiration to the subsequent dreams of upcoming generations. Consequently, you can know the soul or direction of any nation not only by what it remembers but also by what it chooses to disremember. In many ways, Sata has done well to immortalize the memory of Levy Mwanawasa and Kenneth Kaunda. But it is quite absurd that this memory of the great has deliberately left out President Chiluba. Michael Sata’s decision to honour Mwanawasa’s legacy and neglect completely to do the same for Frederick Chiluba is itself quite strange. What is even more bizarre is that while little known characters such as Paul Mushindo are being memorialized by having universities named after them, Sata has decided to completely disremember Chiluba. Chiluba should be remembered as a gallant fighter of democracy and human rights. At the time when Sata and his cohorts were busy eating at Kaunda’s table in the 1980s, it was Frederick Chiluba who held the forte. In spite of repeated temptation to eat from Kaunda’s banquet of corruption, Chiluba decided to be true and faithful to the workers of our nation. If democracy was to be reborn in our country, it had to take the courage and, sometimes, political recklessness of people like Chiluba who stood up to Kaunda and remained steadfast. Michael Sata should help Zambia to maintain this memory. Chiluba’s memory should be kept alive because he also answered the call when the time came to topple Kaunda. It was in 1990. And for those with recollections, Chiluba at first instance resisted the call to lead the MMD. But after reflection, he answered the cry and was voted MMD president the next year. He managed to topple Kaunda because he was in many ways not one of Kaunda’s political puppets. By agreeing to lead “the hour”, he embedded his name in the sands of our national memory. Chiluba should also be remembered and in fact he deserves our memory, because of the courageous and difficult decisions he made as president. He was a decisive leader. He loved his presidency. He never shied away from cameras and neither did he bury his head in the sand when it came to issues affecting the nation. The prosperity we are seeing today in our country is as a result of the vision and foundation Chiluba lay. The privatization of the national economy was a difficult decision he and his team made. But it was a correct decision. And today, Zambia is reaping the benefits of that courage and foresight. The only threat to that economic foundation right now is the all-over-the-map economic policy of the don’t kubeba government. By the time Sata is done with us, Zambia will have returned to those UNIP days when Kaunda controlled everything beginning from a cleaner at a primary school to the prime minister. Armed, not with pangas, but with the memory of those democratic forebears, it becomes incumbent upon all Zambians of good will to hold steadfastly our democratic affirmation. Memory sometimes requires good age to keep up. And I understand that. 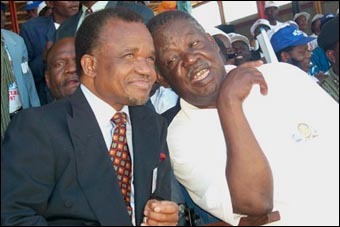 However, there are some among us, who would want us to believe that Sata is deliberately forgetting Chiluba due to personal differences the two gentlemen had. It would be very sad if this were true. Sata should not hold the collective memory of our nation hostage, just because he had some personal scores to settle with Chiluba. The Zambian presidency, as a repository of national memory, should not be used to circumcise and mutilate the foreskin of our political history. I am glad, however, to note that the idea that Chiluba and Sata were bitter enemies does not just stand close scrutiny. For example, in his post-presidency, Chiluba spent more time as a member or sympathizer of PF than any other politician. He spent much of his post-presidency, from 2002 to 2008 openly supporting PF and opposition leader Michael Sata. Chiluba only changed his support back to MMD after the demise of Levy Mwanawasa in 2008. If Sata had a high profile supporter during his struggle for the presidency in the last decade, it was none other than Chiluba. This makes it even more ludicrous that Sata would be so quick to immortalize Makasa, Kaunda, and Kapwepwe and not tag anything after Chiluba. Like all of us, Chiluba had flaws. But these are not so significant as to deserve this disremembrance. We saw pictures of Chiluba’s designer bombasa and shirts and as a nation we questioned how a champion of the poor and workers’ rights came to love bling bling so much. But none of all those should make us doubt the commitment and contribution of Chiluba to our national wellbeing. And requesting that Sata immortalize Chiluba is not asking too much. It is a quest to keep alive the memories of one of our nation’s colorful figures. The London judgment was passed. And Chiluba was found liable to a tune of millions of dollars. But what is still surprising today is that none of that so called stolen cash has been found anywhere. Mwanawasa went to the London court because he told us that Chiluba had stashed stolen money overseas. Justice Smith issued his ruling and to-date, all that allegedly stolen money and assets have not been found. After failing to find the so-called stolen assets, Mwanawasa wanted to come back to Lusaka and grab Chiluba’s house in Kabulonga. If Chiluba had indeed stolen all those millions, where are they? I am not in anyway supposing that Chiluba did not steal, I am merely questioning this assumption and its use by critics to disremember the unassailable reality of the Chiluba Era. Our nation is evolving everyday. And surely, in this evolution, it would be very sad to let Chiluba’s memory slip away. We must continue the ritual of memory. We must relive the sacrifices of the past through the immortalisation of those individuals that have come to symbolize us as one nation. If Sata cared so much about that graveyard, then he should also care that Chiluba’s legacy remain animated. As Chiluba himself put it: democracy is the challenge of change. But one thing that should not change is our resolve to preserve the memory of the great among us. To the memory of Frederick Jacob Titus Chiluba. rank in top10. I know – buying them is too expensive. Ba Munshya, Chiluba made that himself. Very few people appreciate him because he was labelled a thief and he was doing in his late days of Presidency. That is what happen when one is self centered as he was. It is just like Banda, i wander if he will be remember for anything. Sata himself if he misbehave the same can happen to him. Who want’s to remember a thief, who had stolen from? Should we be celebrating thieves? No!